Volunteer attorneys are the backbone of the Lawyer for the Day in the Boston Housing Court Program. Nicholas Bentley, Mintz, Levin, Cohn, Ferris, Glovsky and Popeo, P.C. Katy Ward, Mintz, Levin, Cohn, Ferris, Glovsky and Popeo, P.C. Eric Blythe, Mintz, Levin, Cohn, Ferris, Glovsky and Popeo, P.C. Kristofer Munroe, Lallier Munroe P.C. Adrienne Walker, Mintz, Levin, Cohn, Ferris, Glovsky and Popeo, P.C. Kevin Walsh, Mintz, Levin, Cohn, Ferris, Glovsky and Popeo, P.C. “Volunteering at the GBFB with the BBA is something we look forward to every year. It is always a fantastic event. However, it is just one of the many public service opportunities Margaret and I planned this past year. To name a few, we worked with the Environmental Law Section to clean up Franklin Park. We also volunteered at Cradles to Crayons, helping to put together book packets for kids around Boston. In December we teamed up with the Social Committee of the New Lawyers Section and promoted the Toys for Tots Program by gathering gifts for children for the holidays. We also volunteered with the Prison Book Program by sorting and sending books to various state prisons in the Commonwealth. We also continued our tradition in assisting with the Earth Day Cleanup by volunteering our time (rain or shine) to pick up trash on the Charles River organized by the Esplanade Association. Thank you to our Law Day in the Schools Volunteers!! For more information about Law Day in the Schools, please contact Katie D’Angelo, Public Service Programs Coordinator, at kdangelo@bostonbar.org. Law Day Dinner Honors the Strength of Boston! Monday night, over 1,400 attorneys came out for the annual Law Day Dinner held at the Boston Convention & Exhibition Center. At the Dinner, friends, colleagues, judges, and legislators joined together to welcome Boston’s new Mayor, honor achievements, and celebrate the strength of our city. 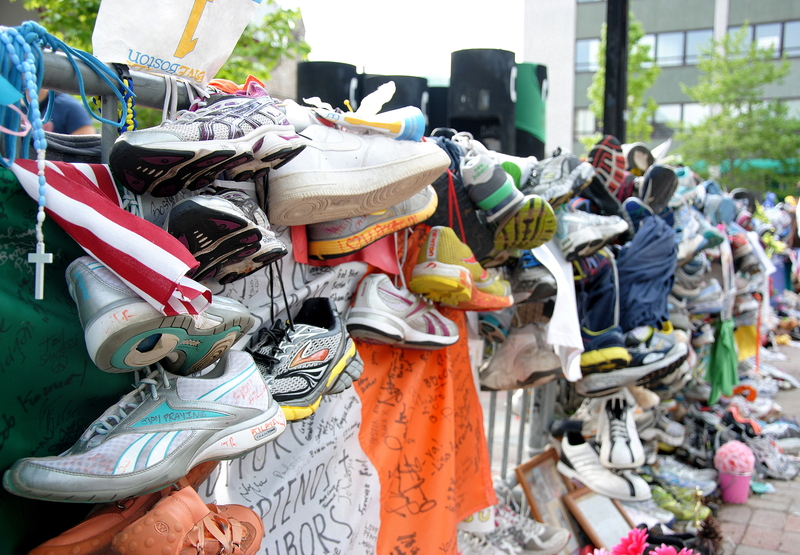 This year, awards were presented to the Marathon Assistance Project’s volunteers, whose quick response to a tragedy through legal assistance changed the lives of many who had been affected by the atrocities and helped them to recover. 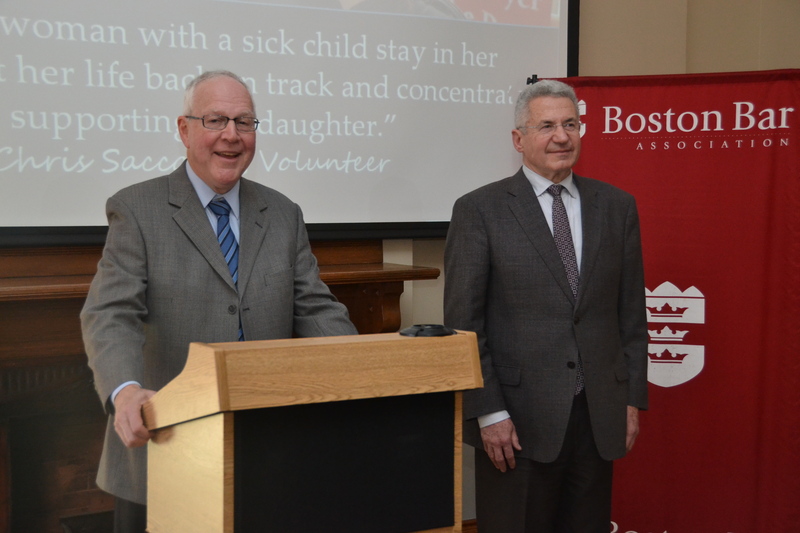 BBA President Paul T. Dacier presented a special award to over 60 volunteer attorneys who provided critical assistance to victims and small business affected by the Boston Marathon bombings. 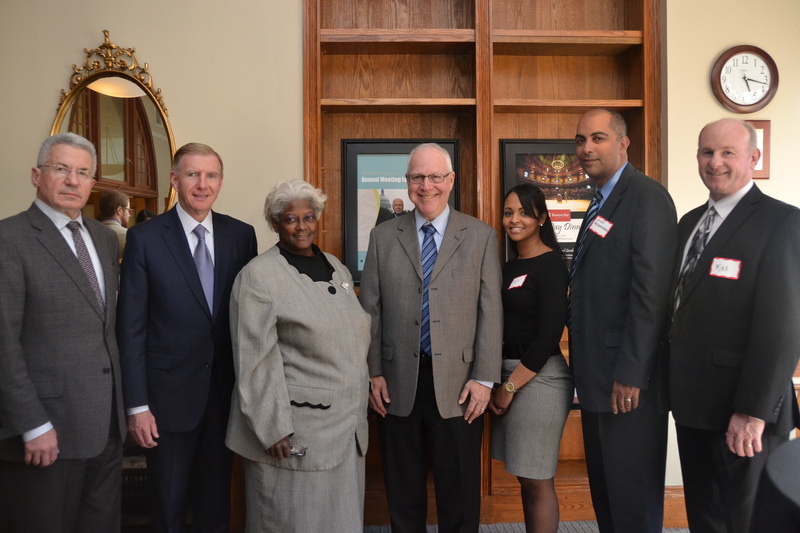 Following the honoring of the Marathon Volunteers, the BBA recognized the tireless work of the Boston Private Industry Council (PIC) for their dedication to providing educational and career opportunities to Boston youth, as well as their longstanding support of the BBA Summer Jobs program. This celebration of the PIC’s commitment to students comes as the BBA’s Summer Jobs 2014 Program is about to begin: currently the PIC and BBA are working to place over 60 Boston Public High School students in paid legal positions for the summer. BBA President Paul T. Dacier presented the Boston Private Industry Council Executive Director Neil Sullivan, School-to-Career and Employer Engagement Director Josh Bruno, and several Career Specialists with an award for their continued collaboration with BBA on the Summer Jobs Program and their work to help Boston Public High School Students find jobs and transition into the workforce. Last but definitely not least, the BBA honored Bonnie Sashin, the BBA’s former Director of Communications & External Relations, for her 26 years of outstanding service and her contributions to the organization and the legal community. Bonnie received a standing ovation from attendees, while guests and people not in attendance were able to tweet their congratulations to Bonnie at #thankyoubonnie, where the messages were broadcasted live on stage. The ceremony concluded with a speech from Boston’s mayor, Marty Walsh, who spoke to attendees about his commitment to community and equality, and how the bar and legal professionals can play a role in his vision for the city of Boston. The Mayor began by thanking all of the volunteers of the Marathon Assistance Project, emphasizing the unique role that as attorneys they were able to play in helping the city recover. Along with Mayor Walsh, Beyond the Billable would like to thank the Boston Marathon Assistance Projects volunteers, PIC, and Bonnie for their tremendous contributions to making the Boston a stronger, happier, and more progressive city – thank you! 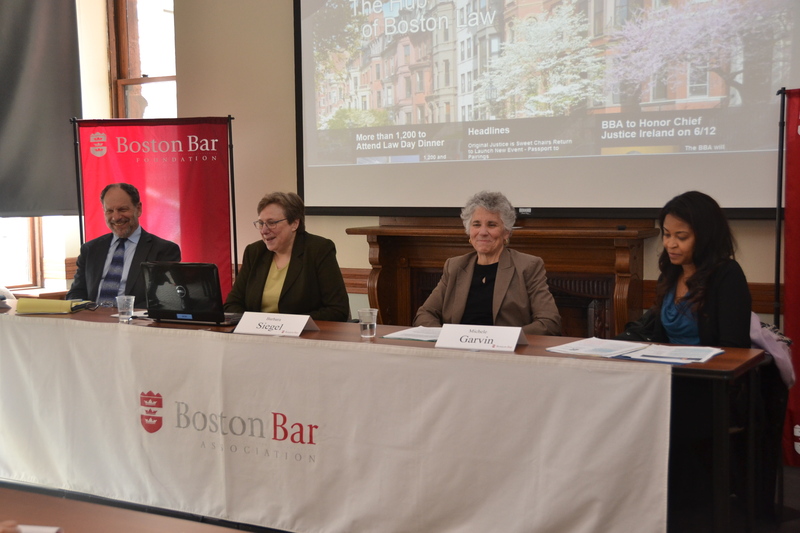 Al Wallis (Brown Rudnick LLP), Barbara Siegel (Volunteer Lawyers Project of the Boston Bar Association), and Michele Garvin (Ropes & Gray LLP) talked about their roles in redefining pro bono work and improving access to legal services at the Delivery of Legal Services’ Hot Topics in Pro Bono program on Monday. Are you an attorney curious about how you can get involved with pro bono work or are you a legal service organization looking for volunteers? Check out the new MassProBono website, deemed the “Match.com” of pro bono services. The new website creates an all-encompassing legal resource and allows volunteer attorneys to search using many different criteria to find a project, case, or organization. Attorneys had an opportunity to catch a sneak peek of the new website during the Delivery of Legal Services’ Hot Topics in Pro Bono program on Monday. Barbara Siegel (Volunteer Lawyers Project of the Boston Bar Association) gave participants a virtual tour of the brand new MassProBono website and demonstrated how this new resource can provide matching services between organizations, projects and volunteers. Legal service organizations can post specialty projects, cases, and other opportunities, while interested volunteers can find cases and projects that meet their interests. Fore more information on MassProBono, read the press release here. 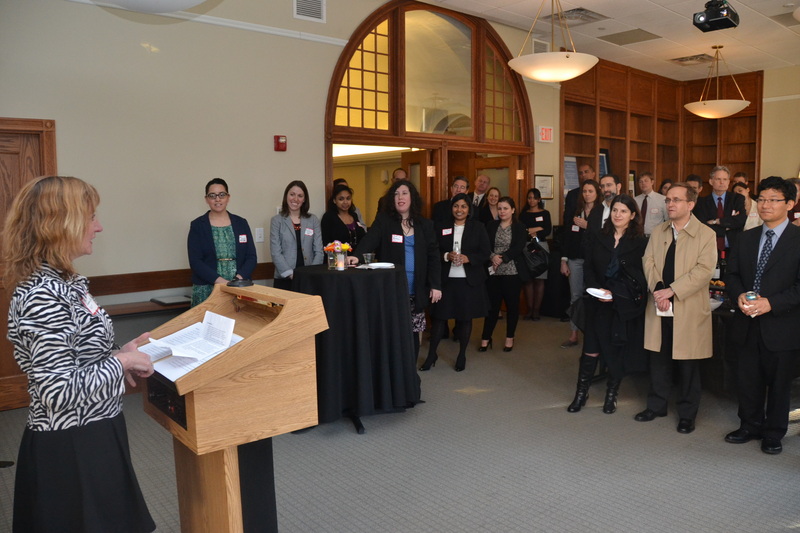 Last Thursday, volunteers, court employees, and program leadership gathered at 16 Beacon to celebrate the success of the Lawyer for the Day Program in the Boston Housing Court Program at the 15th anniversary celebration of the Program. Since the Program’s inception in 1999, over 12,000 volunteers have helped more than 15,000 landlords and tenants navigate through the Boston Housing Court. In addition to the opportunity to network and enjoy food and drink, the evening was filled with a number of volunteer appreciation awards to longtime volunteers who are essential to its longevity. 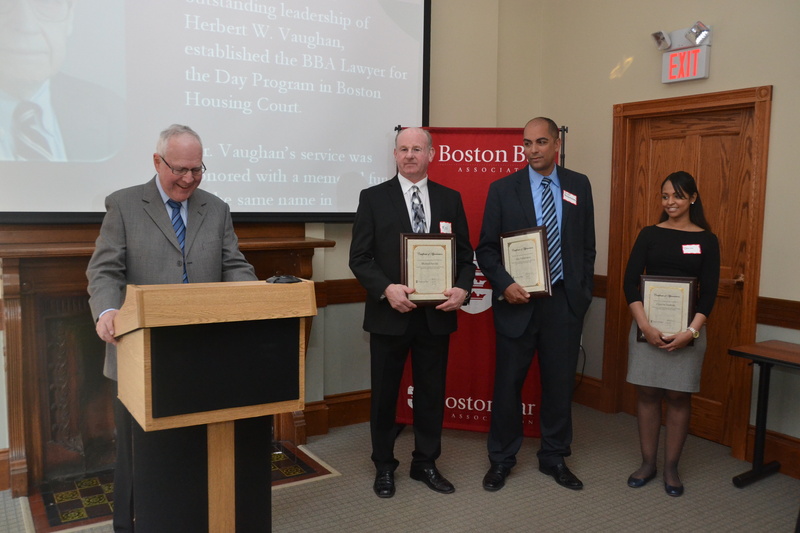 First Justice of the Boston Housing Court Jeffrey Winik presented awards to Sharon Jones (The Law Office of Sharon V. Jones), Andy Cohn (WilmerHale), and Housing Court Specialists Michael Neville, Alex Valderrama, Hector Jenkins, Delia Mathes, and Catarina Andrade. First Justice Jeffrey Winik (Boston Housing Court) recognized Mike Neville, Chief Housing Specialist, Alex Valderrama, Assistant Chief Housing Specialist, and Catarina Andrade, Housing Specialist, for their dedication to ensuring that landlords and tenants have access to justice in the Boston Housing Court. 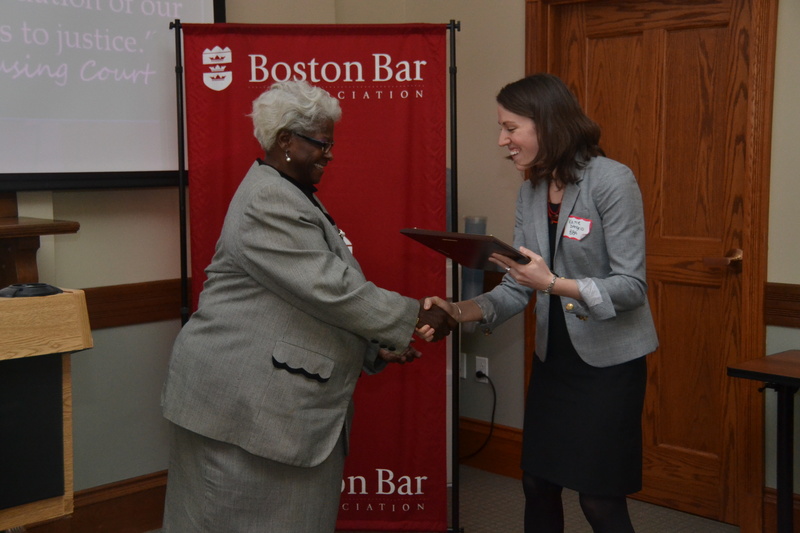 Katie D’Angelo (BBA) presented volunteer Sharon Jones (Law Office of Sharon V. Jones) with a volunteer appreciation award for her unparalleled dedicated to the Lawyer for the Day Program. Sharon has volunteered at the Boston Housing Court almost every Thursday for the past 10 years, and when the Program expanded to include Monday Landlord Advice Day, Sharon immediately volunteered and has staffed that advice day more than any other lawyer. First Justice Jeffrey Winik (Boston Housing Court) spoke of Andy Cohn’s (WilmerHale) long-time commitment to the Program. Andy has recruited volunteers at his firm and taken numerous cases through the Program since it began. Joanna Allison (Volunteer Lawyers Project) offered closing remarks at the celebration, thanking everyone for their efforts and encouraging those to stay committed to the Program. The program is a collaboration between the Boston Housing Court, Boston Bar Association, Volunteer Lawyers Project of the Boston Bar Association, Greater Boston Legal Services and Legal Services Center of Harvard Law School, and is supported by the Wiley Vaughan Fund of the Boston Bar Foundation. After the BBA’s initial press release calling for pro bono volunteers, over 200 individual volunteers, 26 law firms, and 3 law schools offered their assistance. To date, the Marathon Assistance Project has helped 45 individuals and 20 small businesses with their claims & legal issues. 72 attorneys have taken cases through the Marathon Assistance Project. These cases have included helping to complete 14 One Fund claim applications, which have included multiple home visits across New England. If you would like to hear personal accounts of the impact of the volunteer’s work, we’ve gathered a few stories for you. To learn more about the work of our volunteers for small businesses click here. You can learn more about legal assistance for individuals in this recent mailer or the spring edition of the Boston Bar Journal. However, the work is not yet done. As the city continues to heal, members of the Bar stand ready to assist with the second distribution of the One Fund and continue to offer legal assistance to those affected. Stephen Cohen (Choate Hall & Stewart) and Eric Teasdale (Choate Hall & Stewart) taught seniors at Edward M. Kennedy Academy of Health Careers about the hidden costs of buying a car. Last week, Beyond the Billable shared highlights from two legal offices’ experiences “adopting a classroom” through M. Ellen Carpenter Financial Literacy Program. While Sun Life Financial and Liberty Mutual participated in the model in the past, two new legal offices also stepped up to the plate to provide volunteers for the three classroom-based sessions at two Boston public high schools. The U.S. Security and Exchange Commission adopted a classroom at Snowden International High School and Choate Hall & Stewart adopted a classroom at Edward M. Kennedy Academy for Health Careers. Why did Choate Hall & Stewart choose to participate in the M. Ellen Carpenter Financial Literacy Program? What was the highlight of the Program for your volunteers? While students are still traveling the Boston and Worcester Bankruptcy Courts, the classroom based sessions of the M. Ellen Carpenter Financial Literacy Program have wrapped up in the Greater Boston area. This year, four legal offices stepped up and “adopted a classroom” to help meet the growing demand for the program in fifteen schools. In this model, legal offices commit to providing 3-6 volunteers to cover each of the three classroom based sessions. In return, the legal offices were able to provide their employees with an opportunity to give back while partnering with a fellow colleague. Beyond the Billable reached out to the legal departments of Sun Life Financial and Liberty Mutual, both of whom participated in the “adopt a classroom” model last year as well, to hear more about the experience. Sun Life Financial adopted a classroom at Joseph P. Keefe Technical School in Framingham and Liberty Mutual adopted four classrooms at Boston Community Leadership Academy in Hyde Park. Why did your legal office choose to participate in the M. Ellen Carpenter Financial Literacy Program? Our volunteers were so excited to share their experiences that we had to turn this into a two part statement! Stay tuned for part two when we hear from Choate Hall & Stewart and the U.S. Security and Exchange Commission volunteers about their experiences. 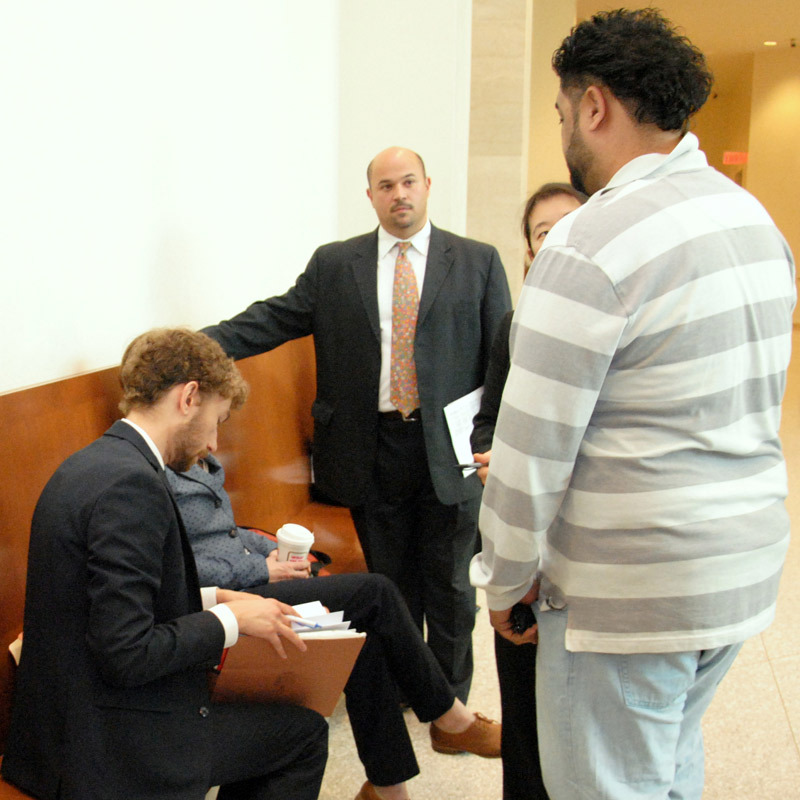 Volunteer attorneys provide critical help at the Boston Housing Court through the Lawyer for the Day Program.